The machine is a specialist to cut the smallest pieces, whenever working with a regular circular saw is impossible and too dangerous. The high-performance 110-120V motor is very quiet and has a prolonged life expectancy. 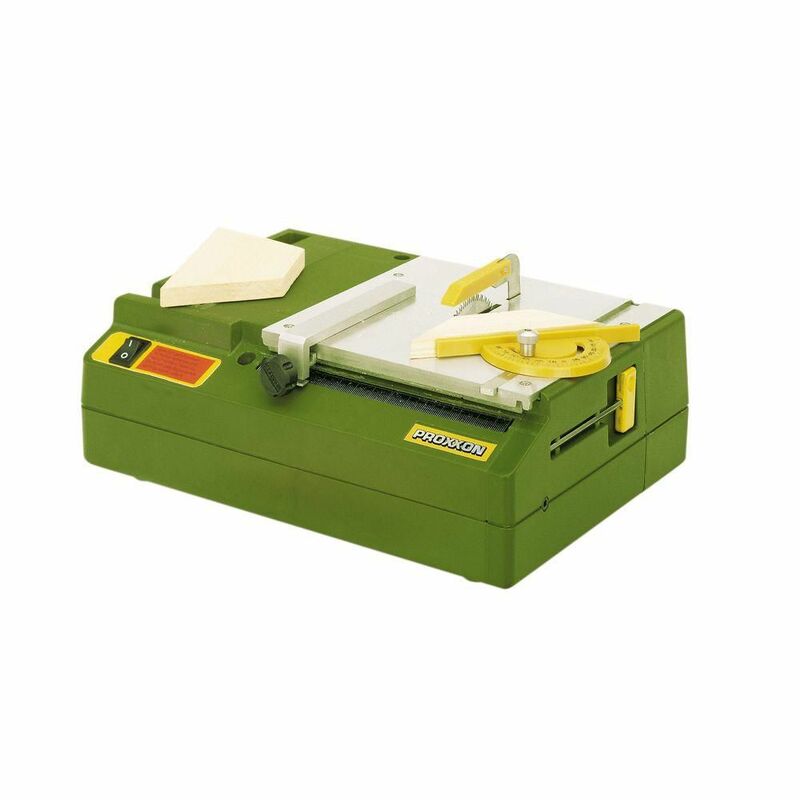 Cutting depths: in wood up to 5/16-inch (8 mm), in plastic (also circuit boards) up to approx. 1/8-inch (3 mm), in non-ferrous metals up to 1/16-inch (1.5 mm). Even fibreglass reinforced plastics can be cut with the carbide tipped saw blade (not included). The machined 6 1/4-inch x 6 1/4-inch aluminum worktable allows for sliding the work piece easily. The housing is made of sturdy plastic (ABS) with a side door to conveniently remove saw dust. With the included Super Cut Saw Blade 2 9/32-inch (58 mm) it is possible to cut soft wood up to 5/16-inch (8 mm). Other saw blades (sold separately) with 2-inch (50 mm), still ensure up to 15/64-inch (6 mm) cutting depth. Overall size approx. 10 1/4-inch x 7 5/8-inch x 3 11/64-inch (265 x 195 x 85 mm). Milwaukee Hyperwire wire brush products offer faster material removal and greater life, yet maintain a finer finish. For maximum weld cleaning in confined areas, the narrow faced Stringer Bead Wheel provides aggressive action. A tight twist provides the narrow profile with the required stiffness to clean pipe joints in fabrication shops and pipeline maintenance. Milwaukee HEPA Dry Filter Kit (2-Pack) works on the M18 Compact Vacuum (0882-20). A high performance filter creates best in class suction for cleanup of drywall dust, wood/metal shavings and common jobsite debris. Includes 2 HEPA filters. Easy twist and lock installation for changing filters. Bench Circular Saw KS 115 The machine is a specialist to cut the smallest pieces, whenever working with a regular circular saw is impossible and too dangerous. The high-performance 110-120V motor is very quiet and has a prolonged life expectancy. Cutting depths: in wood up to 5/16-inch (8 mm), in plastic (also circuit boards) up to approx. 1/8-inch (3 mm), in non-ferrous metals up to 1/16-inch (1.5 mm). Even fibreglass reinforced plastics can be cut with the carbide tipped saw blade (not included). The machined 6 1/4-inch x 6 1/4-inch aluminum worktable allows for sliding the work piece easily. The housing is made of sturdy plastic (ABS) with a side door to conveniently remove saw dust. With the included Super Cut Saw Blade 2 9/32-inch (58 mm) it is possible to cut soft wood up to 5/16-inch (8 mm). Other saw blades (sold separately) with 2-inch (50 mm), still ensure up to 15/64-inch (6 mm) cutting depth. Overall size approx. 10 1/4-inch x 7 5/8-inch x 3 11/64-inch (265 x 195 x 85 mm). Bench Circular Saw KS 115 is rated 4.7 out of 5 by 15. Rated 5 out of 5 by James from Excellent power. Exceeds expectations. ... Excellent power. Exceeds expectations. Rated 5 out of 5 by Yon from Very good product for its size and price. Very good product for its size and price. Rated 5 out of 5 by KSL from Very happy with product AND Home Depot delivery.... Very happy with product AND Home Depot delivery. Rated 5 out of 5 by Rich from This small saw is well made and has been very useful. I have been able to rip thin basswood shee... This small saw is well made and has been very useful. I have been able to rip thin basswood sheetstock into specific sizes for my model building activity. Using common table saw practices, such as using a short spacer on the rip fence, I have been able to crosscut multiple parts to the same length. I have only owned it a short time, but it is a real timesaver. The dust removal vacuum attachment work really well with my shop vac.